Learn About the Astonishing Power of Lithium Orotate! Few things are as important as your mental well-being. If your mood is off or stress levels are high, it slows down your energy, outlook, and nearly every part of your life. Lithium is a naturally-occurring, important trace mineral with a long history of therapeutic use for supporting a healthy mood and overall mental wellness. When bound to orotic acid as lithium orotate, the result is specialized nutrition for a happy mood, healthy response to occasional stress, and normal cognitive function. Each vegetarian capsule provides 10 mg of elemental lithium. Stress can make you feel fatigued, unmotivated, and down. Lithium orotate positively supports normal brain chemistry to promote a feeling of confident relaxation. Stop feeling on edge and start feeling what it means to be calm and collected. A down mood is like a dark room with drawn curtains; it's time to let in the sunlight. Lithium orotate supports the production of brain-derived nerve growth factor, which not only has a neuroprotective effect but may also promote a positive, stable mood. Feel joy, happiness, and — most importantly — like yourself. Maintaining consistent focus in a fast-paced world is a challenge. When demands pile up, it can be overwhelming and hard to stay on task. Lithium orotate helps brain receptors and neurotransmitters so you can concentrate your focus on the important things in life. Life is full of ups and downs and sometimes the lows can make you feel discouraged about the future. The neuron-stimulating effects of lithium orotate can help you feel better equipped to deal with life’s extremes. Stay balanced and move past the thoughts and emotions that hold you back. When the volume in your head doesn't turn down with the lights, lithium orotate can help. Lithium orotate promotes restful sleep, all night long. Experience what it's like to wake up happy, refreshed, and clear-minded. Promotes a normal response to temporary stress and anxiety. Supports a stable, balanced mood and emotional state. Encourages normal brain health, structure, and function. Promotes a deep sense of calmness and clarity. Promotes sharp mental focus and motivation. Promotes stable behavior and positively influences impulse processing. Provides nutritional support for emotional wellness and behavior. Supports the brain’s detoxification pathways. Stress throws gut bacteria out of balance and, overall, it’s as bad for the digestive system as a diet filled with junk food. Too much stress is associated with poor cardiovascular health. Stress weakens the immune system. Experiencing too much stress can raise the risk of obesity, reduce the body’s ability to regulate inflammation, and affect long-term health. There is a link between work-related stress and cancer in men. Stress is contagious! Studies have found that if the people around you are stressed, it affects your stress level, as well. Stress affects memory in middle-age adults. Stress affects physical appearance and makes skin look dull. Stress negatively affects decision-making abilities and even promotes poor decision-making. Easy-to-swallow capsules provide 10 mg of elemental lithium. Meticulously formulated with the highest quality ingredients for consistent, predictable results. Lab tested for purity and consistency. No soy, artificial colors, dairy, gluten, or other toxic impurities. Manufactured in the USA at an FDA-registered, cGMP (current Good Manufacturing Process) compliant facility. 1. Should I get regular check-ups and testing while taking lithium orotate? Follow the advice of your healthcare practitioner. Once-a-year kidney function and thyroid function tests should be performed if you have known thyroid or kidney conditions or as recommended. 2. Does lithium orotate interact with other nutritional supplements or prescription drugs? Lithium orotate can interact with a number of prescription medications, including antidepressants, blood pressure medication, anti-seizure medications, NSAIDs, and diuretics. If you’re taking these, or any other prescription medication, consult your healthcare practitioner before adding any form of lithium to your routine. Additionally, lithium orotate can interact with some herbal and nutritional supplements, including, but not limited to, St. John’s wort, GABA, tryptophan, 5-HTP, and other supplements that affect neurotransmitters. 3. How long does it take to notice the benefits of lithium orotate? Results vary but some people have reported feeling benefits in under an hour, while others don’t notice benefits for a few weeks. Lithium orotate is lithium bound to orotic acid. The highly bioavailable combination is like brain food that promotes a stable, balanced mental state, positive response to stress, and overall neurological health. Vegetable-based capsules are high-quality, all-natural capsules that are free of toxins and impurities. 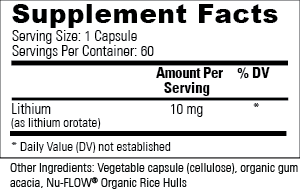 Nu-FLOW Organic Rice Hulls are an all-natural flow agent used to ensure consistent product quality. Organic gum acacia is an all-natural flow agent used to ensure consistent product quality. Take one capsule twice daily or as recommended by your healthcare practitioner. Consult your healthcare practitioner if you are pregnant or nursing, if you take an SSRI, MAOI or other similar medication, if you have kidney problems, or take an ACE inhibitor or diuretic, if you have a thyroid condition, or for any additional concerns. How much elemental lithium is in Global Healing Center's Lithium Orotate? Is this product suitable for vegans and vegetarians? Does this product contain genetically modified ingredients (GMOs)? Can elemental lithium affect kidney function? Can lithium orotate affect the thyroid? Should I get regular check-ups and testing while taking lithium orotate? Should I get my lithium levels checked after taking lithium orotate? Can I drink alcohol while taking lithium orotate? Does lithium orotate have to be taken every day? Can lithium orotate be taken with Neurofuzion®? Can children take lithium orotate? Can pregnant or nursing women take lithium orotate? Can lithium orotate be given to pets? Are any health conditions not compatible with lithium orotate? Does lithium orotate interact with other nutritional supplements or prescription drugs? What’s the best time to take lithium orotate? Are there any special instructions when taking lithium orotate? How long does it take to notice the benefits of lithium orotate? Each capsule provides 10 milligrams (mg) of elemental lithium. This product is suitable for both vegans and vegetarians. Global Healing Center's Lithium Orotate does not contain GMOs. Lithium is mined all over the world. Global Healing Center's Lithium Orotate is manufactured in Utah at an FDA-registered, cGMP (current Good Manufacturing Process) compliant facility. Each bottle of Global Healing Center's Lithium Orotate contains 60 capsules and will last one month when taken as directed. Lithium supports the health and function of the hippocampus and interacts with several neurotransmitters and receptors in the central nervous system to promote mental focus and memory. Long-term, large servings of any type of lithium can affect kidney function; however this is usually seen in people with pre-existing kidney issues. Lithium and sodium have similar effects on nerve cells but because it is smaller in size, lithium displaces sodium in the brain. The excessive sodium has to be excreted through the kidneys, which can stress the kidneys. It is important to drink adequate water when taking lithium orotate. Long-term, large servings of any form of lithium can affect thyroid function, which is usually reversible upon discontinuing use. If you take our Lithium Orotate as directed, you will not get a large serving, and should not have an issue, but check with your healthcare provider if you have a thyroid condition. Follow the advice of your healthcare practitioner. Once a year kidney function and thyroid function tests should be performed if you have known thyroid or kidney conditions, or as recommended. If you are interested in checking your lithium levels before or after starting supplementation, hair analysis and blood testing are the most accurate ways. Lithium urinary excretion levels can also be tested if desired. Alcohol should be avoided while taking lithium orotate. Most people see the greatest benefit by taking lithium orotate every day as directed. Neurofuzion contains lithium orotate and several other ingredients; lithium orotate is a stand-alone mineral product. Many people prefer to take either lithium orotate or Neurofuzion but others like to take it together. Just be aware of the total serving of lithium orotate that you will be consuming if you take both products. Check with your healthcare provider if you have questions. Lithium orotate is not recommended for children unless supervised by a healthcare practitioner. Lithium orotate is not recommended for pregnant or nursing women. Lithium orotate is not recommended for pets. People with severe thyroid issues or kidney disease should not take lithium orotate. Lithium orotate can interact with a number of prescription medications, including antidepressants, blood pressure medication, anti-seizure medications, NSAIDs, and diuretics. If you’re taking these, or any other prescription medication, consult your healthcare practitioner before adding any form of lithium to your routine. Additionally, lithium orotate can interact with some herbal and nutritional supplements, including, but not limited to, St. John’s wort, GABA, tryptophan, 5-HTP, and other supplements that affect neurotransmitters. Lithium orotate may be taken at any time throughout the day. However, many people report that taking it after meals is most beneficial. If taken on an empty stomach, lithium orotate may cause mild stomach upset in some individuals. Stay well-hydrated and drink plenty of water when taking lithium. Results vary but some people have reported feeling benefits in under an hour, while others don’t notice benefits for a few weeks.